The relations between art and technology have a long history in Argentine art. Light and movement experiments in the 1940s were the precedents to the many trends developed during the 1960s, including kinetic art, video art and some incursions into expanded cinema. Mechanical and electronic devices, light, machines, new materials, photographic and cinematographic projections, sound systems, video and computers came to appear very often in the works and reflections of young artists, stimulated by a favorable political climate and a fluid dialogue with the international art circuit. At the end of nineteenth century, Argentine artists began to have a slow but constant dialogue with Europe. Going to Italy or France to improve artistic knowledge was an ordinary practice among young art students, encouraged by public grants that supported their expenses. In the 1920s, Emilio Petorutti and Xul Solar shocked Buenos Aires with the exhibition of the outcome of their studies in Europe. The former had incorporated Cubists and Futurists analytical gaze, showing a rational rather than intuitive approach to the world. 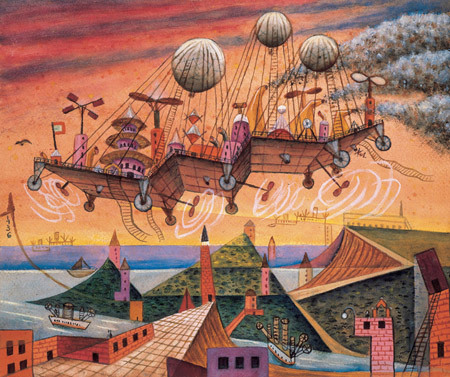 Xul Solar preferred a lyrical approach, but his imagery, full of fantastic architectures, mechanical structures and flying machines, depicted a world forged in the heat of technological progress. 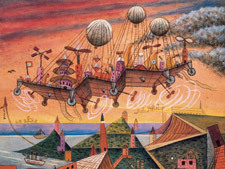 References to science and technology would increase in the thinking Concrete artists, the first Argentine avant-garde movement that developed during the forties. Their Manifiesto Invencionista (1946) proclaimed: "Scientific aesthetics will replace the age-old speculative, idealistic aesthetics... The metaphysics of 'the beautiful' have died by withering. What matters now is the physics of beauty." References to science took formal existence in the exaltation of geometric and mathematical structures; this was intended as a means of suppressing individualism in favor of an art with social impact. This scientific basis would persist and even increase in the different groups that emerged from the original Concrete nucleus: Perceptism and Madi movements. Within the latter it would emerge the first specific experiments with technology. The Manifiesto Madi declared: "By Madi Art we mean an organization of the proper elements of every art in their continuity. This involves presence, mobile dynamic arrangement... playfulness and pluralism as absolute values, any interference by expression, representation and meaning being consequently abolished." Reclaiming an art of “mobile dynamic arrangements” independent of “expression and representation” encouraged the production of works with movement, not only as representation but also as concrete reality. The same manifesto declared: "Madi sculpture will be tridimensional, without color. Total form and solids within an environment, with articulation, rotation and translation movements. Madi architecture will be mobile, displaceable environments and forms." One example of these premises was the articulated sculpture Royi, by Gyula Kosice, a piece that not only allowed its shape to be changed but which invited the spectator's active participation in this process. Kosice started doing neon sculptures in 1946; with these sculptures began the dialogue between art and technology in Argentine art. That same year, Kosice made a sculpture with fluorescent tubes, even though he apparently did it for utilitarian purposes. Shortly thereafter, Lucio Fontana presented Concetto Spaziale (1951), his first neon sculpture, at the ninth Milan Triennial. This was the first of a series of experiments with lighting that would bring him to work with fluorescent paint and black light as well. The following year, along with his colleagues from the Spatial movement, he drafted the Spatial Movement for Television Manifesto, which he read in front of the cameras of the Italian TV station RAI, and which became one of the precedents of the future development of video art. Meanwhile Kosice was producing his first hydrosculptures. They began with a mobile sculpture, A Drop of Water Cradled at High Speed (1948) and a series of Plexiglas works that incorporated water as a sculptural element. In 1959, the artist also wrote the manifesto Water Architecture in Sculpture. The 1960s were characterized by an uncommon expansion of art means, with broad experimentation and development of hybrid forms. This effervescence occurred in a booming art circuit fueled by galleries, museums and other art institutions, which stimulated a fluid dialogue between Argentina and the world. Argentine artists took part in this dialogue both inside and outside the country. Searching for means to produce their work, many Argentine artists left the country to develop their ideas in a more suitable context. As it happened before, interest in science and technology appeared not only in technological artworks. Sculptors and painters alike were also interested in addressing the deep influence of industrial and technological developments on everyday life. This interest was evident both in artistic and discursive productions. Within the first, there was a strong creation of art pieces that made use of new materials and a defined tendency to op-art. Within the second trend, there were some programmatic writings like the Generative Art Manifesto (1960), and some important reflections like the unpublished text by Luis Felipe Noe, Art between Technology and Rebellion (1968), where the author meditated on the impact of mass media and technology on both society and the arts. Simultaneously, many artists openly researched with mechanical and electronic technologies, light, machines, new materials, photographic and cinematographic projections, sound systems, video and computers. FROM IMAGE TO ENVIRONMENT: "EXPANDED CINEMA"
By the 1960s, television had entered into homes and was redefining the relations between audiences and moving images, thereby de-ritualizing cinematic experience. Nevertheless, the deconstruction of cinema was to occur in places –museums and art galleries– in which it was still a stranger. Influenced by pop and conceptualism, some artists gave rise to experiments that incorporated films into space. These pioneering works oscillated between two contrasting poles. At one end, they were influenced by hippies’ sensorial "recovery", exalting the sensorial component of the image-subject relationship. At the other end, artists belonging to the incipient conceptual trend singled out the informational component of images and their capacity to refer to reality. In 1966, after absorbing the hippie culture and the theories of Marshall Mc Luhan in United States, Marta Minujin began a series of works that highlighted the mediatization of everyday life, submerging the audience in the visual, hyper-fragmented universe of the mass media. The first of these works, Simultaneity in Simultaneity, was produced that year at Buenos Aires' Instituto Di Tella. Minujin invited 60 media stars to be filmed, photographed and interviewed before taking their positions in front of a television, which they had to look at while listening to a radio. Eleven days later, the same people at the same positions saw the photographs and films taken the first day projected onto the walls, heard their interviews at the room's loudspeakers, saw the first day's images on television and heard a special radio program about the event. In this way, the protagonists of the event were invaded by themselves, translated into the multi-languages of media. The work privileged the physical aspects of media rather than their information content, their bare presence rather than their communication value. 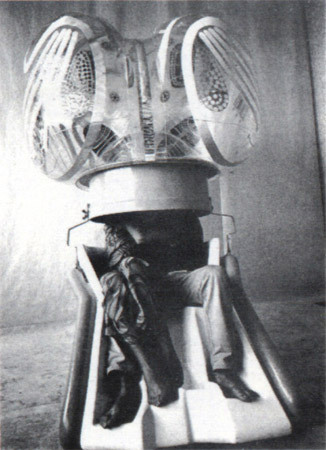 The following year, Minujin carried out a similar experiment at Montreal's Expo '67, Circuit, a more complex environment that continued to privilege the sensorial aspects of media. However, there were a number of significant variations. This time, participants with similar characteristics were selected by a computer on the basis of a newspaper questionnaire. The setting incorporated information about the participants projected on the walls, while closed-circuit television enabled certain groups to observe the behavior of others. Interest in the behavior of social groups increased in Minucode (New York, 1968). Here, Minujin made three cocktails with people from different social groups – entrepreneurs, media personalities and artists– which she shot with a hidden camera. Some days later, the recordings were projected onto the walls of a room into which the same participants were invited. In the final situation, each participant was interacting not only with the images but also with the actual people of the different groups. This determination to introduce bodies within the images had precedents in theatrical and choreographic works created at the Di Tella Institute, where stage sets were often replaced with slide projections. In Symphonia (1969) by Oscar Araiz, the bodies of dancers served as screens for cinematographic images that transformed them into dancing wraiths. Meanwhile, some artists who were beginning to venture into conceptualism were using film to explore its meaning-building mechanisms. In 1967, Oscar Bony presented Sixty Square Meters of Wire Gauze and its Information, an installation made up of 60 square meters of wire gauze laid out on the floor of a room and a film projector showing a fragment of the same wire gauze on the wall. The work compared the sensory experience of the metallic gauze that the spectator had to walk on to enter the installation with the same material transformed into visual information. The idea was to establish a concept: that of the image stripped of all its aesthetic attributes and transformed into a simple (tautological) representation of reality. In Silence (1971), by Leopoldo Maler, the relation between the object and its information is metonymical. Here, the image of a sick woman replaces a real one and is projected onto a bed watched over by a nurse. The work combines a performance with what we would nowadays call a video installation due to the horizontal placing of the image, something absolutely unusual in a normal cinema situation. Lea Lublin used film projections in Inside and Outside the Museum (1971), a work that sought to establish a dialogue between political, social and cultural events and the parallel developments in the arts. For this, the artist set up screens showing art documentaries in front of a museum, and placed diagrams inside comparing significant historical events with artistic developments over the same period. Here, cinema was not just an informational medium but the most suitable one for reaching a public that did not consist of museum-goers. Meanwhile, David Lamelas was using film to analyze both a space and the narrative model of cinema in Film Script (1972): a short film showed the actions of a gallery employee while three slide projectors varied the narrative sequence of it. The first projector kept up a continuous sequence of selected stills; the second modified the order of two scenes and the third kept the most important parts and left out one of the scenes. In this way, the film came face to face with the actions that the employee was carrying out during the exhibition, and with its own narrative logic. The history of video art in Argentina began in 1966 with Simultaneity in Simultaneity. However, there had been a major precedent in La Menesunda, an environment that Marta Minujin and Ruben Santantonin presented at the Di Tella Institute in May 1965. The work included what was possibly the first closed-circuit TV in the history of art. The device was between two monitors that were broadcasting ordinary programs: the visitor was thus confronted with his own image as part of the fragmented discourse of television. Despite this fact, the work cannot be considered the starting point of video art since that effect was only one of many in La Menesunda. It was not until Simultaneity in Simultaneity that the electronic image had a clear main role to be considered as initiating the genre. 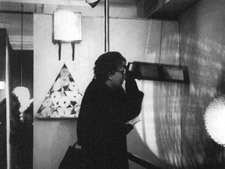 In 1967, David Lamelas presented Situación de Tiempo (Time Situation), a room lit by 17 television sets transmitting vague noise and sound signals. The installation called attention to the temporal nature of the electronic medium. 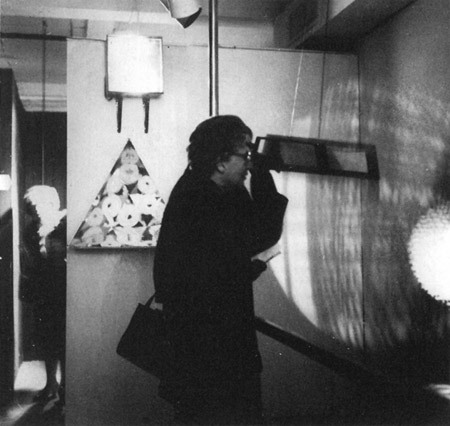 This work was connected with another of 1968, where Lamelas arranged two slide projectors in a room; these only projected light, the basic condition for the a projected image. In 1969, two other pieces used the electronic image: Especta, by Frontera Group and Fluvio Subtunal by Lea Lublin. The first was a communication experiment with a mini-recording studio and six television sets. Spectators answered questions as they were recorded on video. On the way out, they could see themselves replying on the screens among the rest of the public. One year later, this work was part of the exhibition Information at the New York Museum of Modern Art. Fluvio Subtunal was a journey into nine zones. One of these, the technological zone, included 15 television sets in closed circuit showing what was happening in the other zones. The audience became aware of the magnitude of the work and of their own participation when they saw others doing what they had been doing minutes earlier. The "technological zone" enabled visitors to transcend the playful mood of the piece and reflect on their actions inside it. As mentioned above, as early as 1967 Marta Minujin used a computer to select the participants for Circuit. At that time, the Di Tella Institute had a sound laboratory equipped with computers for sound experiments. But it is 1969 that can be stamped as the year of origin for computer art in Argentina, when the exhibition Art and Cybernetics showed the works produced in Buenos Aires by six Argentine artists alongside works from North America, England and Japan. The following year, the Art and Communication Centre (CAYC) organized the event Argentina Inter-medios (Argentine Inter-media). In the catalogue, Jorge Glusberg explained: "In Argentina Inter-medios electronic music, experimental films, poetry, projections, dance, and pneumatic and kinetic sculpture are used to constitute a total environment where a dynamic exchange of different stimuli places media at the service of audiovisual perception. The intention of events of this type is to draw the attention of experts and scientists in the social disciplines, as well as of the informed public, to the advantages of an interdisciplinary integration that improves and broadens the scope of human interests". These objectives were different to those promoted by GRAV, since the appeal here was to specialists and not to ordinary people. Nevertheless, the intention in both cases was to transcend traditional media and to promote the impact of art on social environment. 1968 marked the creation in Buenos Aires of CAYC, an interdisciplinary center whose objective was to promote projects where "art, technological media and community interests combine in an effective exchange that highlights the new unity of art, science and the social environment in which we live". The institution was inspired by Experiments in Art and Technology (E.A.T. ), the organization founded by Robert Rauschenberg and Billy Klüver, but its influence began to fade with the growing interest in local and Latin American conceptualism. In any case, a great number of experiments in art and technology took place at the Centre. In fact, CAYC was particularly supportive of this kind of production since it had a number of relevant facilities for that. Its availability of video equipment and closed-circuit television made it possible for artists to experiment with electronic imaging. At the same time, CAYC brought together many local and international artists involved in technological research. A number of the Centre’s artists were engaged in the reflection on the relations among art, science, technology and life. Luis Benedit investigated animal and vegetal behavior by producing artificial environments. His works combined architectural and engineering projects in order to generate works where artistic experience turned into observation of life. Victor Gripo researched the processes of energy transformation using very simple technical resources. In contrast, Leopoldo Maler's mises en scene were spectacular and called for complex technological devices. But the use of technology in the work of these three artists acquired a different meaning from that intended by their forerunners. Technology was not used as a means to transform life but as a paradigm of the production of information and knowledge. Utopian visions were replaced by systematic studies, which made it possible to investigate reality from a detached viewpoint. With the instruments that technology provided, the artists became observers of reality, analysts of its systems, media and processes, and exegetes of discursive, material and ideological constructions. Leonardo Electronic Almanac, 13:4, April 2005.